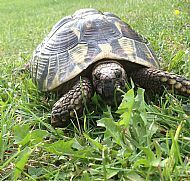 Tortoise BnB provides luxury holiday care, so you can enjoy your holiday, safe in the knowledge that your tortoise is enjoying theirs! 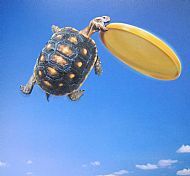 Peace of mind for you and your tortoise: Based in the Hertfordshire countryside near Redbourn, Tortoise BnB is run by me, Anne. When I'm not looking after tortoises, I'm growing weeds, plants and flowers for tortoises. The health and welfare of every tortoise is at the heart of Tortoise BnB. If a tortoise needs veterinary care during their stay, they will be taken to Nine Lives Vets the same day. In Summer: Your tortoise can enjoy time in the organic wild flower garden, in an escape proof run, or stay indoors under heat and UV lights. For safety all tortoises are brought inside at night time, to sleep in spacious, individual tortoise tables or cages. In Winter: Non-hibernating tortoises, stay warm indoors in spacious individual tables or cages with appropriate heat and UV lamps. Spaces at Tortoise BnB are limited, early booking is advisable, particularly at busy times of the year. Tortoise Bnb have joined forces with a vet and veterinary nurse to deliver 3 workshops on tortoise care. Workshop 1: General Tortoise Care Workshop 2: Advanced Tortoise Care. Workshop 3: Sucessful hibernation. The Tortoisebnb Facebook page is very popular with tortoises - and their owners. While you're away you can check out what your tortoise has been doing. 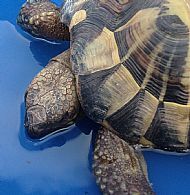 Click on the 'f ' icon at the top of the page to see what the Tortoise BnB guests have done today!